Are you looking for a reputable fish finder that will provide you with clear underwater images and fish arches? Then the Echo 551dv is the right gadget. It is a premium fish finder that’s fitted with an all-in-one transducer which delivers highly scanned images on a vertical and horizontal split screen. With these at hand, not only will you know what is located underwater but you will get to find the best fishing spot. It provides the clearest possible fish arch returns and bottom structures under the boat. Read this important Garmin Echo 551dv review. It will open your eyes to a world you never knew about. It comes with a 5 inch VGA display with a resolution of 480 by 640 pixels. The display offers colored in-depth images of structures underwater as well as fish. This allows you as the user to spot stuff with ease without even straining to. The unit gives the user the option of viewing images vertically or horizontally on the screen with ease. In both options, the user can zoom in order to identify structures and fish arches with ease. It offers split screen mode which allows the user to watch different sonar’s simultaneously. The amount of detail you can see underwater is wonderful. On the right side of the unit, you will find the control buttons. At the top, you have the power button and the menu button, below it you have the navigation and enter button. The buttons are well labeled allowing for easy identification. When pressed, they elicit the correct function allowing the user to control and have access to a wide array of features. The screen has the advanced smooth scaling technology. This technology is designed to provide the user with smooth transition from shallow water to deep water. This is very useful especially when fishing in unknown lake waters. It is quite difficult to navigate in unknown choppy waters and could to damage of the boat underside. With this technology, not only will the user identify structures underwater but one will note the change in depth too. 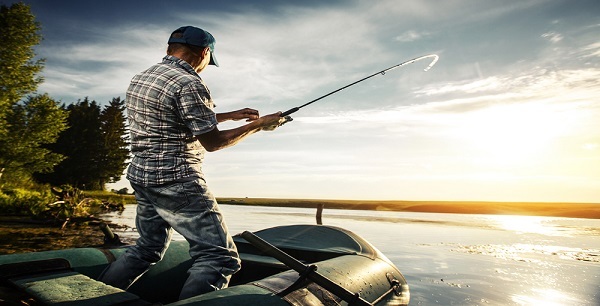 When concentrating on finding the best fishing spot, you can at time miss something very useful especially the fish arch. With the auto gain technology, you are assured of better viewing. This feature can be used automatically in order to adjust the gain settings. This helps to minimize clutter which allows one to have clear images in the end. It also helps to maximize the spotting of objects like fish under the water with ease. The dual beam transducer provides HD-ID and DownVu capabilities. With the 500 w power, the sonar channels can reach up to a depth of 2300 feet. This is highly convenient and suitable for different water bodies for example the river or lake. 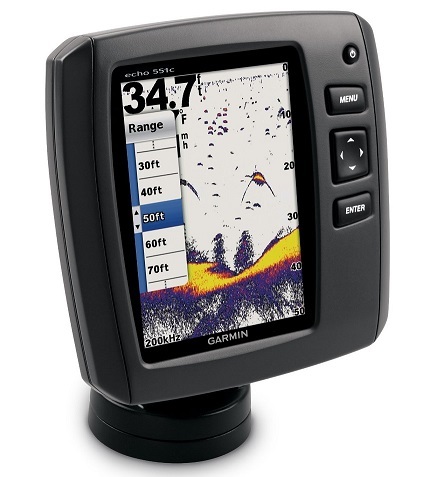 According to Garmin Echo 551dv review, the transducer is known to have a great accuracy and sensitivity. It provides excellent bottom tracking and target separation capabilities. The sonar displays a clear photograph of the underwater structure and fish arch under the boat. It comes with a 5 inch color VGA display that offers split screen view - horizontal and vertical display. ​It has a dual sonar channel that reaches up to 2300 feet deep allowing detection of underwater structures plus fish clearly. ​It has the ultra scroll feature which is highly useful at targeting fish arches when the boat is traveling at high speeds. 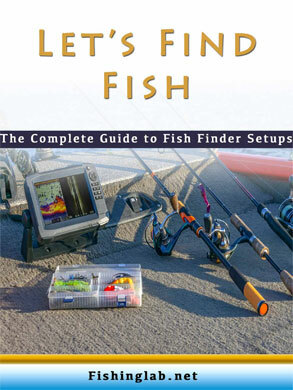 ​It has the Auto Gain technology that allows better viewing of fish. The feature can be used to automatically adjust gain settings thus minimizing clutter and maximizing targets. ​You can rewind and replay previously saved sonar history thanks to the sonar history rewind. It lacks GPS capabilities that would help with navigation especially maps. It lacks smartphone syncing to allow replaying of recorded sonar history on a smart device. Does it have a swivel mount? Yes, it comes with a swivel mount that ensures easy adjusting when it comes to viewing at different angles. Currently, the model only supports English language. How long is the transducer cable? Its comes with a 20 feet long cable which is sufficient enough. The unit is a decent and feature rich fish finder that is a must have for anyone who loves to fish. It comes with a 5 inch VGA display that allows for vertical and horizontal viewing. It also offers split screen viewing. With the zooming capability, the user can spot small details underwater. With the dual channel sonar that has a depth of 2300 feet; it is suitable for use on rivers and lakes. It can record sonar history during use and with the sonar history rewind function; users can replay everything allowing one to identify anything they missed during scanning. It has user friendly controls which allow the user to control the device with ease. If you are looking for the best fish finder that will improve your catch, I highly recommend the Garmin Echo 551dv.